Here in South Central Texas where it feels like the summer has been going on for decades and gas prices just continue to climb and climb, what’s a parent to do? Sometimes it feels like the only two options are to succumb to the boredom and lethargy or dive into deep debt to Chevron. Here are some ideas for cheering up your school-aged kids without leaving the house. 1. Have a taffy pull. The kids get to participate in making the taffy by pulling it over and over until it changes color and texture. The recipe can be a little touchy; so it might be better to experiment beforehand if you are planning to do this for a crowd. 2. 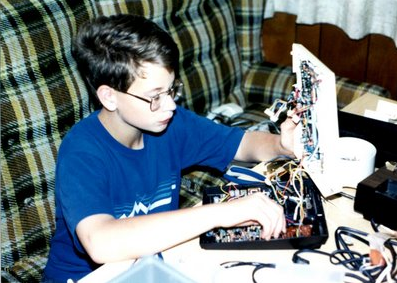 Let your kids dissassemble an old piece of electronic equipment*. You know- the old broken microwave you’ve had in the garage for years because you intend to fix it “some day.” With a screwdriver, pliers, and hammer in hand, your child could have no end of fun with that thing. 3. Teach them the old fashioned game of pitching pennies. All you need is a bunch of pennies, a wall, and two or more players. For extra fun, let them keep the pennies. 5. 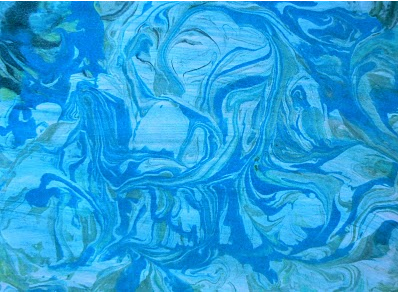 Make easy and beautiful marbled paper using shaving cream and tempera paint. These papers make great cards, giftwrap, or bookcovers. 6. Find out if you really can fry an egg on your sidewalk. 8. Send them on a photo scavenger hunt. Have them look for particular colors, shapes, or phenomena that they find in nature. 9. Make an aquascope for viewing all those interesting creatures and plants at the bottom of the pond out back (or take it to Barton Creek to explore underwater there). All it takes is a yogurt container, plastic wrap, and a rubber band! 10. 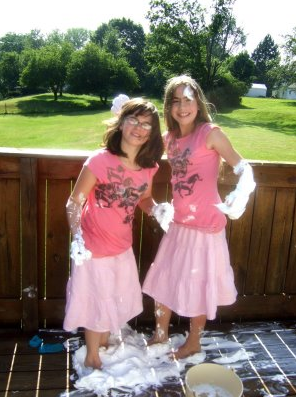 Give them each a can of shaving cream, and let them go crazy spraying each other. Be on the lookout for an upcoming post on having free fun at home with toddlers and preschoolers. *Some electronics may be unsafe for children to handle. Please take care when choosing electrical items to take apart.